Throttle lever and carburetor feature full-closed detection system. Engine design meets California Air Resources Board (CARB) off-road emissions standards. New rider's position features 8mm lower handlebar, seat and footpegs for improved center of gravity and rider feel. Round-tube steel frame with removable aluminum subframe is lightweight and durable. Powerful four-stroke 450cc liquid-cooled four-valve Unicam engine is based on the award-winning CRF450R and CRF450X engines. For 2006, the TRX450ER is an all-new machine from the ground up, and features more power, sharper handling and now with electric start as standard. 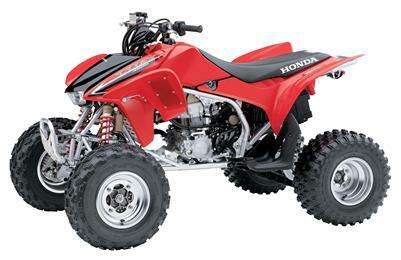 2008 Honda TRX450ER with Electric Start.